Apple's iPhone, iPad and iPod touch are in many ways evolved iPods. Since the iPod rapidly became king of the music players, it's fitting that many great apps for music fans are available on the App Store, to push your device beyond the limitations of the iPod app and your own music collection. The App Store has about 50 billion one-star reviews for Spotify, written by people who seem to think it's daylight robbery that you should have to pay for music. Although we'd sooner see the fee drop to a fiver a month, Spotify for iPhone nonetheless remains a joy. You can play over 3G, access your Spotify playlists, and sync on-the-fly between desktop and mobile versions. Even better, Spotify for iPhone caches up to 3,333 tracks for up to 30 days. Although Last.fm has been overshadowed by Spotify, the iPhone app's worth a download, due to it creating personalised radio stations based on your favourite artists or genres. You might not get to hear precisely what you want, but chances are you'll discover new music that appeals. 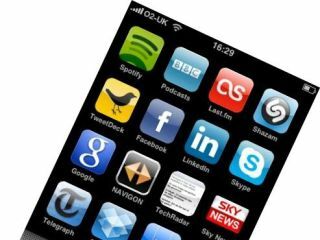 If you can't be bothered splashing out on a DAB radio, plonk your iPhone into a dock, connect its audio output to some speakers, and play one of over 30,000 radio stations through Internet Radio Box. Shake-to-shuffle is a nice touch, but all the important features are there, too, including favourites management, a configurable sleep timer, and the ability to play in locked mode. If you're annoyed at your device's meagre capacity and long for a 200GB iPhone, Simplify Music is the next best thing. In tandem with a Simplify account, an app on your Mac or PC, and a Wi-Fi or 3G connection, you can access your (non-DRM) music from anywhere, along with streamed music from collections of up to 30 friends. Coming across like a plug-in for iPod, Lyrics+ enables you to show lyrics while you play your favourite songs. Most of the iPod app's functionality is present and correct, enabling easy access to your music. Although not all lyrics are available, the developer notes that those shown are legal, drawn from LyricFind, and lyrics previously viewed are cached for offline usage.